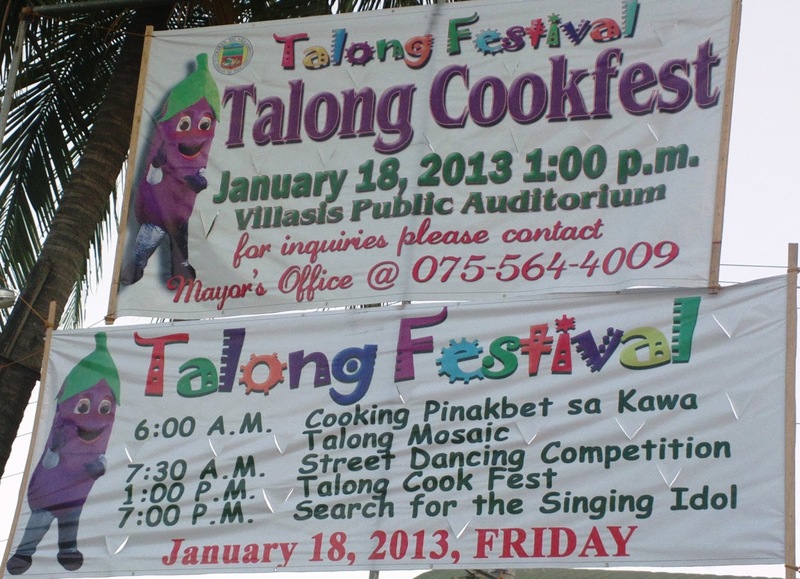 Home / Holidays / Local Places / News / Talong Festival / An Invitation for the 8th Talong Festival Celebration! An Invitation for the 8th Talong Festival Celebration! 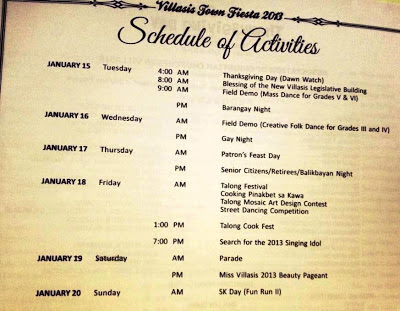 This year is already the 8th year of the Talong Festival in the Villasis, Pangasinan and everyone is invited to watch the festivity on the streets and in the public auditorium throughout the day! Villasis, dubbed as the vegetable bowl of Pangasinan’s town fiesta had actually already started. This year, the celebration happens from January 15-20, 2013. Some events have passed including the opening Thanksgiving Day during Dawn Watch hours (4 AM) followed by the blessing of the town’s new Sangguniang Bayan building last January 15. 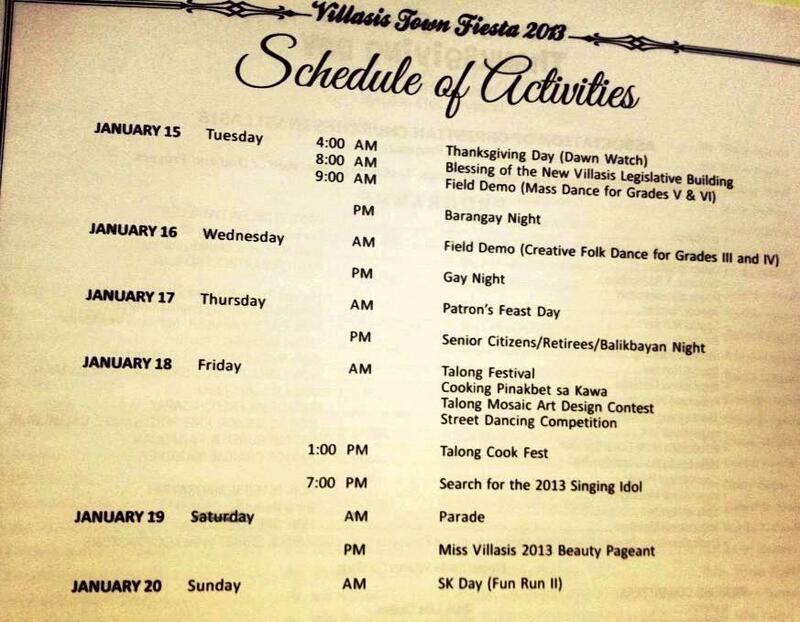 Other events are listed on this programme posted by a fellow Villasianian in a related Facebook page. See photo below. There are events held during day but crowd drawers are events held at night, with one exemption (see next paragraph). This is because most local residents go out early evening for a few hours of exhilarating rides and games, hoping to see lady luck stare at them in the face and win even a simple mug. Afterwards or in between, they can drop by the open public auditorium to join or watch an event. As for me, I’ve tried almost all rides and games as early as December 2012 at the Catholic Church grounds (where these can be found). I got me a mug and a few snacks at some of the coin tossing games. I’ve also packed and wrapped gifts for me and a few folks through the RTW area. But as always, the fiesta’s highlight is the Talong Festival. Festivities related to the eggplant crop will begin as early as 7:30 in the morning until late in the afternoon of January 18. Itineraries include Cooking Pinakbet sa Kawa, Talong Mosaic Art Design Contest, Street Dancing Competition, and Talong Cook Fest. The latter will take place in the afternoon while the first three happens in the morning. If you’re coming to watch, do enjoy the Talong Festival for 2013!